Wishing your lawn and landscape looked more lush and vigorous? If so, chances are your soil could probably use a little TLC. The health of your soil greatly affects the vigor and beauty of your lawn and landscape plants. If you’ve been on an organic soil building program for a length of time, whether you manage it yourself or have a pro do it for you, you may notice that you don’t have to fertilize or water quite as much. As time goes on, compacted soil will loosen, microbial activity increases, and soil texture becomes softer and easy to plant into. The type of texture affects soil’s ability to retain moisture and uptake nutrients. Sand, clay and silt make up the components of “soil”. Sand has the largest particles and clay has the smallest. Silt lies somewhere in between. Blackland prairie is the type of soil we have here in North Texas. This type of soil is also referred to as “cracking clays” or “black gumbo”. If you’ve ever let it dry out in summer, or tried to plant directly into native soil, then you’ll understand why! While black gumbo is high in nutrients, its compacted quality and texture results those nutrients being bound up and difficult for plants to take up through their roots. The dense clay structure also does not allow for water to drain easily or for oxygen to reach the root zone. If you don't aerate your heavy clay soils properly, plant roots can suffocate in times of heavy rain and flooding (or overwatering). You can improve black gumbo soils by adding compost, expanded shale, and other organic conditioners. What’s in my soil? The top 3 macronutrients for healthy plants HERE. Our Blackland Prairie soil also contains chalk, limestone and shale from the upper cretaceous period, which gives it a dark gray or black color and a high soil pH. They are often deficient in iron, zinc and copper. Adding organic matter such as our housemade liquid compost can provide the additional nutrients your soil needs. Because clay soils tend to be very compacted, water tends to sit on top of the surface, resulting in runoff. 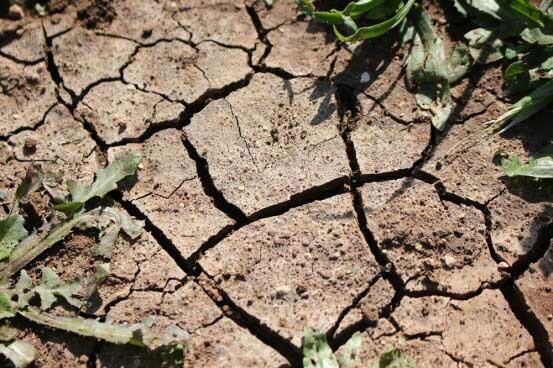 As clay soils dry, it can be very difficult to rehydrate them, leaving your plants thirsty. Conversely, when heavy clay soils are very wet, it takes a long time for water to drain away, which can drown your plants. Adding organic matter to improve the texture of the soil will help water to drain properly. Longing for thick green grass? Improve soil health! Did you know your soil is home to millions microorganisms working to keep your soil bioactive and plants in top health? Earthworms, beneficial nematodes, mycorrhizal fungi and good bacteria are active in healthy, balanced soil. These creatures process nutrients essential to plant health and improve soil texture to ensure reduced compaction and good oxygen flow through plant roots. When earthworms move into your soil, you know you’re heading in the right direction. A balance of beneficial organisms also can outcompete soil pests. When your soil has good texture, drainage and aeration and a balanced pH, the biology of the soil is in tune to keep lawn and landscape plants growing strong. Ready to improve your soil’s biology? Our Soil Building program focuses on feeding the soil for healthier plants and a more robust lawn, all while reducing your impact on the environment.